Now in third edition, with updates to reflect developments in our understanding of learning difficulties in maths, this award-winning text provides vital insights into the often confusing world of numeracy. By looking at learning difficulties in maths and dyscalculia from several perspectives, including the vocabulary and language of maths, thinking styles and the demands of individual procedures, this book provides a complete overview of the most frequently occurring problems associated with maths teaching and learning. Drawing on tried-and-tested methods based on research and Steve Chinn’s years of classroom experience, it provides an authoritative yet accessible one-stop classroom resource. select appropriate materials and visual images to enhance understanding. With useful features such as checklists for the evaluation of books and a comprehensive overview of resources, this book will equip you with essential skills to help you tackle your pupils’ maths difficulties and improve standards. This book will be useful for all teachers, classroom assistants, learning support assistants and parents. The current edition of the book is very practical and accessible. It is comprehensive, covering a wide range of aspects of maths difficulties and is very helpful for teachers trying to understand the specific difficulties that their students have with Maths. Do you recommend that we publish an updated edition? Steve’s books are very well respected and well known and are generally the first port of call for someone looking for information on dyscalculia and maths difficulties generally. 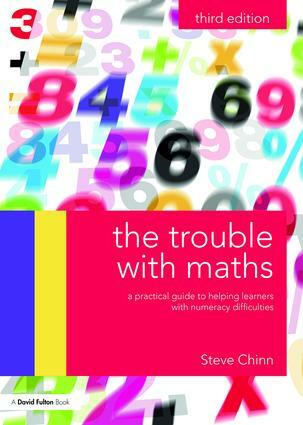 Steve Chinn is a Visiting Professor at the University of Derby and is also author of More Trouble with Maths: A complete guide to identifying and diagnosing mathematical difficulties, 2nd edition and editor of The Routledge International Handbook of Dyscalculia and Mathematical Learning Difficulties.